Mercedes-Benz has extended its partnership with AEG and Oriental Pearl Group (OPG) for the naming rights of Mercedes-Benz Arena in Shanghai until 2025 – an additional five years beyond the existing 10-year naming rights deal negotiated by arena operator AEG, which commenced in 2011. In partnership with the Oriental Pearl Group (OPG), AEG was instrumental in the design, development and commercialization of the 18,000-seat multipurpose venue originally built for the 2010 Shanghai World Expo, and commercial operations fully commenced with the Mercedes-Benz brand on the building in 2011. “Over the past six years, Mercedes-Benz Arena has managed to integrate some of the world’s most advanced resources to redefine the live entertainment and service experience for the Chinese audiences, continuously setting new industry benchmarks in China as well as in Asia,” said Huang Jin, Vice President of Culture, Entertainment & Tourism Business, Oriental Pearl Group (OPG). In 2016 alone, Mercedes-Benz Arena in Shanghai welcomed more than 900,000 guests while presenting 273 ticketed events, thereby making it Asia’s No. 1 sports and entertainment venue. 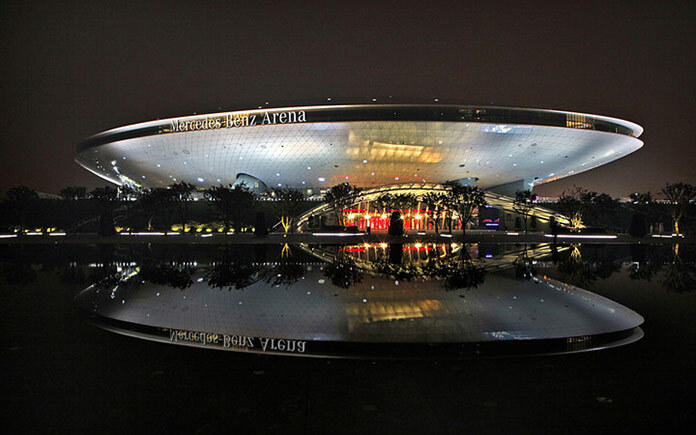 Mercedes-Benz Arena is Shanghai’s premier live entertainment venue and the centerpiece of a mixed use entertainment complex. With 18,000 seats, 82 luxury suites, various clubs and meeting rooms the Mercedes-Benz Arena offers state-of-the-art technology and amenities for staging the biggest and most popular events in China. The entertainment complex includes a 700 seat theater, public ice skating rink, a six screen cinema, and 20,000 square meters of retail space featuring a variety of shops and restaurants. The Mercedes-Benz Arena, Shanghai is operated by AEG China in partnership with OPG and defines world-class management – delivering unprecedented entertainment and customer service which exceeds the expectations of artists, sponsors, guests and business partners. The Mercedes-Benz Arena is also host to national and international events including Hong Kong, Taiwanese, Western, and Mainland stature. These internationally known performers include The Rolling Stones, Taylor Swift, Katy Perry, Bruno Mars, Justin Bieber, Metallica, J Lo, Usher, NBA Global Game China, Fist of Power Boxing Game, BigBang, EXO, Jacky Cheung, Faye Wang, Eason Chan, Jay Chou, Jonathan Lee, Jolin Tsai and more. The Mercedes-Benz Arena hosts over 270 events and 900,000 attendances, with 4.8 million visitors annually presenting events ranging from professional sports, live music, family shows, boxing and special events. Since its inception, Shanghai’s Mercedes-Benz Arena has set itself apart through its industry-changing design, operations, programming and array of amenities that put the guests first. AEG, OPG and Mercedes-Benz, together with the venue’s founding partners, have continued to deliver the most entertaining and engaging fan experiences in one of the world’s leading arenas.